Cyberattacks are a threat to businesses worldwide, and they are getting larger and more sophisticated. The industry’s approach to protecting against these threats must change fundamentally to stay ahead of this growing threat. 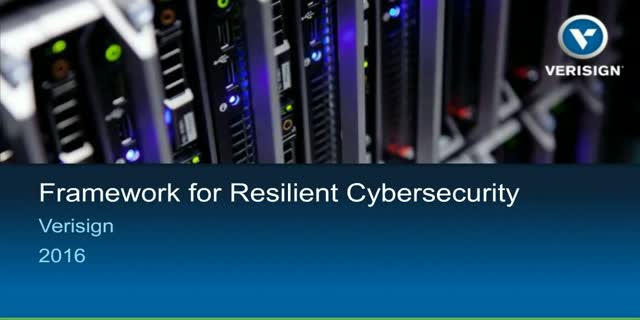 For too long, the problem has been tackled piecemeal, using isolated devices or services, but protecting against advanced cyberattacks requires communication and coordination among many components – from networking equipment, to specialized appliances, cloud-based services, as well as actionable threat intelligence. A shift in security architecture is needed, to an open platform where devices and services from different vendors can share, and act, on threat intelligence information, all in concert and in the proper context. It must be a hybrid platform; allowing on-premises security appliances to detect and mitigate attacks, locally, while automating alerts, and switchover, to cloud-based services should an attack threaten to swamp the business’ network connection. Join Michael Kaczmarek, Sr. Director of Product Management, and learn how to assist with designing a resilient security ecosystem by maximizing an API-centric approach. Website availability and security is critical for today’s organizations. Downtime can reduce sales, decrease market share and cause loss of a competitive advantage. Join Terry Bernstein, Director, Product Management, VeriSign, Inc., on December 15, at 11 am EST, to learn about some of the common causes for downtime, how to increase web resiliency, and recommendations on how to help improve website availability. Recent DDoS attacks trends indicate that DDoS attacks are becoming more sophisticated and persistent. What do these DDoS trends mean for your organization, especially during the upcoming holiday season? Join Rohit Kinra, Director, Product Technology, Verisign, as he discusses the behavioral shifts observed by Verisign in recent DDoS attacks and what should concern you. Rohit will also share recommendations on how your organization can prepare and defend against DDoS attacks. Distributed Denial of Service (DDoS) Attacks are a real threat for today’s organizations. Current trends indicate that these attacks are becoming increasingly more sophisticated, persistent and larger in scale, causing potential damage to your revenue, brand and productivity. Is your organization prepared for the next evolution of DDoS attacks? Join Nishit Sawhney, Director, Product Management, Verisign to learn about the latest DDoS attack trends including attacker behavioral shifts, attack vectors and increased attack sizes. Nishit will also dissect a real-world example of a recent DDoS attack and best practices on how to prepare and defend against increasingly complex and sophisticated DDoS attacks that can overwhelm even the best equipped systems. Join Patton Adams, experienced network defender and Verisign iDefense Director of Cyber Threat Analysis and Reconnaissance as he presents Verisign’s unique view into the evolving DDoS attack ecosystem and recommendations for staying ahead of these increasingly effective threats. Throughout 2015, Verisign noted a continued upward trend in the size, frequency and complexity of distributed denial of service (DDoS) attacks against its customer base, including rising average attack sizes and increased targeting of IT Services organizations. In addition, Verisign observed increasing availability of DDoS-as-a-service offerings from hacktivist and cyber criminal groups, and the prevalence of DDoS malware targeting the open-source Linux operating system, among other trends. Patton Adams is Director of Threat Analysis and Reconnaissance at Verisign iDefense, leading an internationally-distributed team of researchers monitoring, analyzing, and reporting on global cyber crime, espionage, and hacktivist activity. Before coming to Verisign, he led and served on cyber threat analysis teams at Northrop Grumman, supporting the US Army 1st IO Command and Army Cyber Command and later Northrop Grumman’s corporate information security operations. Co-author of the 2012 US-China Commission report, “Occupying the Information High Ground: Chinese Capabilities for Computer Network Operations and Cyber Espionage,” Patton specializes in cyber espionage analysis, strategic geopolitically-focused research, and analytic process improvement for risk mitigation and long-range decision making. He conducted undergraduate studies in Foreign Service at Georgetown University and graduate studies in ancient Cambodian history at Cornell University. The Domain Name System (DNS) is involved in nearly every transaction conducted on the Internet. It translates your online requests into a set of navigation instructions to get you to the right location. It is also one of the richest data sources about online activities. Recent enhancements to DNS continue to extend the privacy protections enabled by this fundamental Internet infrastructure service. This session will survey these enhancements and discuss the appropriate role of the DNS in an organization’s overall privacy and security strategy. Cyber threats are at an all-time high, presenting numerous challenges to organizations and end users. Additionally, with the increasing importance of mobile devices and Bring Your Own Device (BYOD) initiatives, endpoint management and security is becoming more critical. In light of these trends, proactively protecting against threats is a constant and ever-changing battle. Verisign DNS Firewall is a cloud-based network security and threat intelligence service built upon our global recursive DNS platform that offers robust protection from unwanted content and malware as well as customizable filtering down to the individual DNS level. Verisign DNS Firewall provides organizations with the opportunity to secure the rapidly growing landscape of devices on their networks with a single, simple modification – an update of the recursive DNS settings. Our personal and professional attack surfaces have never been greater, and they are only expected to grow as organizations and individuals continue to increase their reliance on the digitally connected world for a variety of tasks. Throughout 2014, and into 2015, Verisign iDefense® Security Intelligence Services observed cyber criminals increasing their focus on attacking point-of-sale (PoS) systems and developing and deploying new banking malware. Global events continue to drive a higher frequency and severity of hacktivist activities and pro-state cyber operations. Vulnerable legacy and open-source operating systems continued to complicate the security of critical networks. This report presents an overview of the key cyber security trends Verisign has noted and expects to see throughout the remainder of 2015. It features conclusions drawn from Verisign iDefense research and analysis covering cyber-crime, hacktivism and vulnerabilities. Over the course of the past decade, there has been an increased reliance on network availability as applications and systems that support business-critical applications move to private and public cloud environments. Among the many changes experienced, none has been more profound than the shift from on-premise based solutions to cloud environments. 74 percent of enterprises have a multi-cloud strategy. The challenge in securing and at the same time making available end-user applications is a formidable one. Many of today’s enterprises – including banks, IT Services, retail, and media and publishing companies are shifting their workloads onto public, private and hybrid cloud infrastructure. This opens organisations up to security risks and end user downtime. Traditional security tools aren’t effective in cloud environments and organizations are left on their own to secure and ensure availability of their critical applications.  Gain full visibility of traffic to effectively manage it across multiple cloud environments. Join Verisign for an insightful overview of six approaches, along with key considerations that can help organizations of all types create a cyber-intelligence program. 1. Determine what level of maturity your threat operations capability needs to be and create a strategy that aligns to your business objectives and the threat's operational phases. 2. Create intelligence requirements that can be operationalized in a manner that maps to security controls and provides the required decision support to help a machine or a person do their job more effectively. 3. Conduct a gap analysis on your existing security operations capabilities, talent levels and collection capabilities. 4. Build a team that understands these threats and is passionate about the mission. 5. Investigate what you look like to the various adversaries you're likely to encounter. Take an open-source “red team” approach to understand your threat exposure on the Internet. 6. Create solid metrics that support your strategy and demonstrate value back to the business.